Biography and accomplishments or why Amenhotep I was famous: The third son of Ahmose I, his elder brothers died and Amenhotep succeeded to the throne when his father died. Two of his names meant "Bull who conquers the lands" and "He who inspires great terror" indicating that he was a military leader. He was known to lead expeditions into Nubia, Canaan, Mesoptamia and Kush. A great innovation, the water clock, was invented during his reign becoming one of the many famous Ancient Egyptian Inventions. 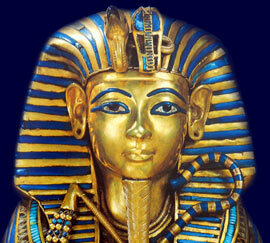 Amenhotep I was the first pharaoh to separate his tomb from his mortuary temple. His children died young, so he left no heir to the throne of Egypt. He was therefore succeeded by Thutmose I who was married to Ahmose who was believed to be the sister of Amenhotep I and the daughter of Ahmose I. Each section of this Ancient Egyptian website addresses all topics and provides interesting facts and information about the Golden Age of Pharaohs and of Amenhotep I. The Sitemap provides full details of all of the information and facts provided about the fascinating subject of the Ancient Egyptian Kings - their life, family, reign, dynasty, important dates and events and accomplishments.